Most of last year, the garden was looking borderline sleazy. (Maybe gardens look like their owners, rather like pets are meant to. Oh dear.) It was saved only by the annuals, and occasional biennial, that either I or nature had seen fit to populate it with. Without those it would have been not worth looking at, at all. 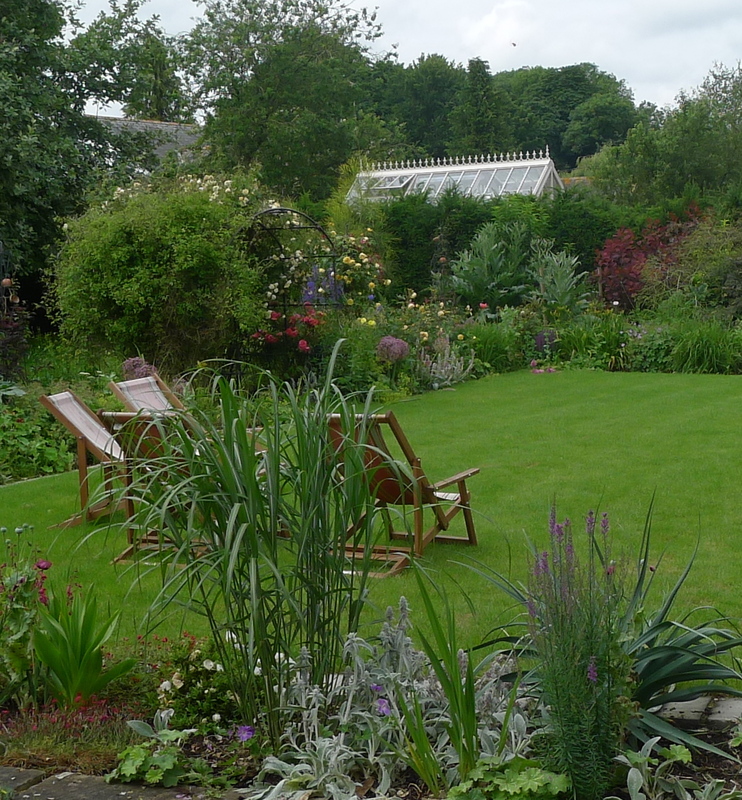 Don’t get me wrong, there are sections of the garden that are just perfect – for us that is, no Chelsea contenders here. The clay oven, the tree house, the labyrinth, Poultropolis, Woodhenge, the 6 Trees for example. (The Trees deserve a capital T as they dominate the garden. They are huge, older than anyone living in the village, magnificent and more important than all my little planting schemes put together.) All of these are exactly as they should be, and exactly right for my family and our lives. It’s the smaller stuff that is a swine. Take the flower beds (please?). There are four of these, each a good-size, and there are whole days when they look really quite passable. The weaknesses, however, are legion. Now like every gardener in the world, I have the worst possible conditions, and no-one has to endure more than I, sob. The soil is exhausted, thin, flinty, and over chalk. There are times when it feels like trying to grow plants in a colander full of rubble. (It does warm up quickly though, and boy does it drain.) After over a decade of neglect from a previous owner, the beds are rife with ground elder, bind-weed, and couch. (But no knotweed or mares-tail, so I’m not doing that badly really.) The wind tears though, barely impeded by the hedges, roaring off the downs that lie beyond the paddock next door. We have rabbits, and corm-excavating pheasants (but no deer), and arguably I have not helped myself by bringing the bird-gang into the garden. Shrub roses struggle (and a struggling rose is not a thing of beauty), delphiniums disdain, and phloxes simply despise me and all my works. Camellias laugh in my general direction, and I’ve killed so many achillea (how? rabbits?) that if plants ever achieve sentience I’m looking at a charge of genocide. But the euphorbia love it here, all 11 types of them. The sedums are in heaven, and don’t flop, and the geraniums deserve every bit of ground they adorn. 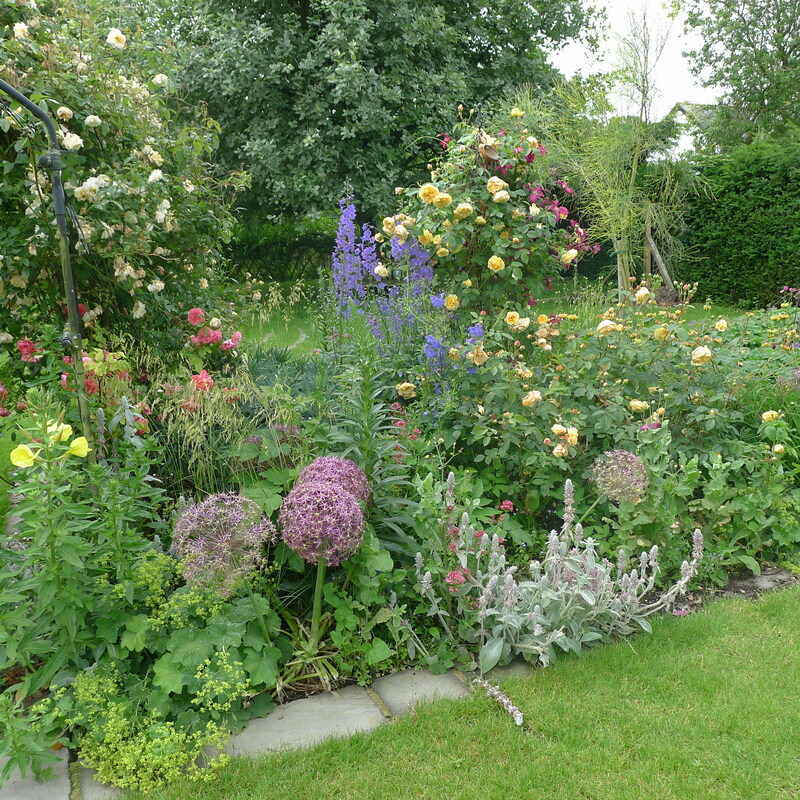 The rambling roses are wonderful, and the nepeta looks magnificent (if rather trampled, and heavily populated by stoned cats). Irises bake to perfection, and the digitalis ferruginea (had to go double Latin eventually), seeds with joyful abandon. The poppies are promiscuous to a gloriously wanton degree, and the little sternbergia lutea are a little gems of golden egg-yolk joy as the year winds down. In spring the labyrinth is bracketed by swathes of narcissus “Thalia”, and under the apple trees the bluebells (non-scripta) are beginning to make their presence felt. And then there are the scents! There is mahonia, then the daphnes, and there is lily of the valley, the queen of them all. Then there are tulips, followed by sweet but never sickly yellow day-lilies, and roses that fill the air in June, and can be sought out all the way to November. So perhaps it’s not too bad, and perhaps I should be a little less crazy.